Smiling in Second Grade: A Birthday Celebration! 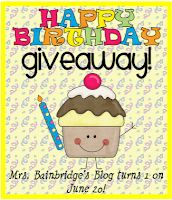 I'm teaming up with Mrs. Bainbridge for her blog's first birthday! She is having a huge giveaway with lots of great prizes (including one from me)! Click the picture to head over to her blog and enter! 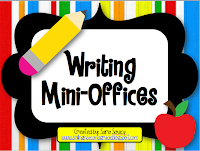 I'm giving away my Writing Mini-Offices. They seem to be a big hit in my store! 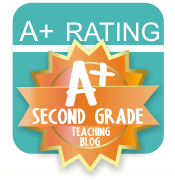 Head on over to *Mrs. Bainbridge's Class* to see what else you can win! Shoot - can I enter? I need to win those writing offices!!! LOL. Guess what I'm putting in my wish list?!?!?!?! I'm excited about this giveaway!! Glad to find your blog!! !